Earl’s Gourmet Grub is an artisanal deli and gourmet market that opened in May 2010 in Los Angeles. The 1000sf. 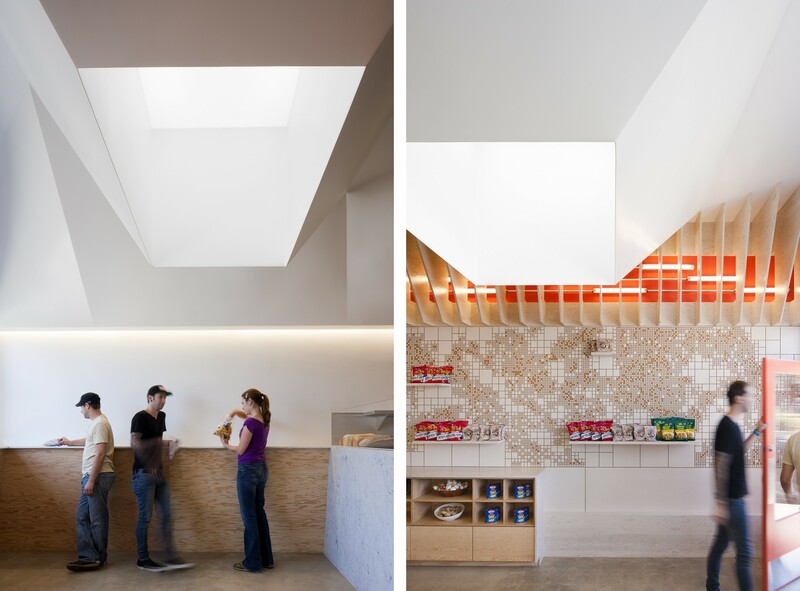 tenant improvement is conceived of as an interior landscape; a variable and shifting space defined by a series of torqued ceiling surfaces and light ‘scoops’. 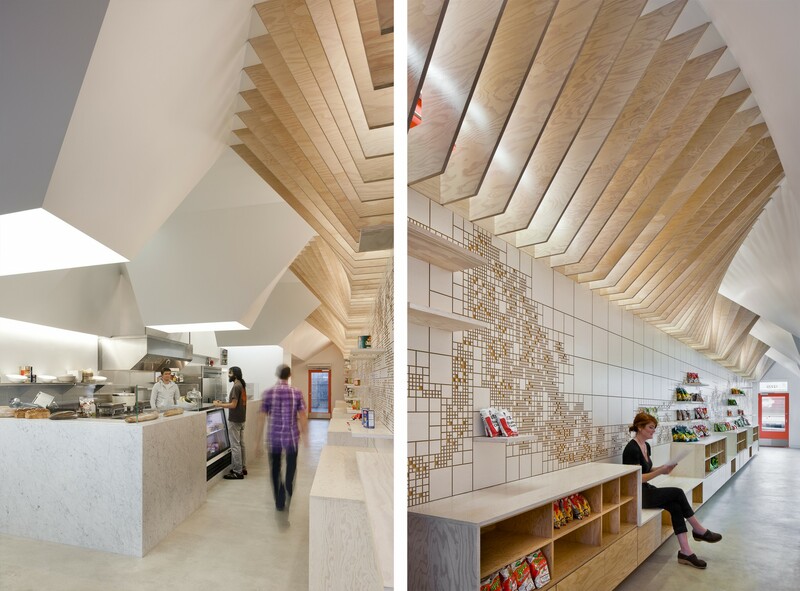 The ceiling creates an airy, light-filled canopy with local intensities modulated by wood ‘baffles’ of oscillating depth. 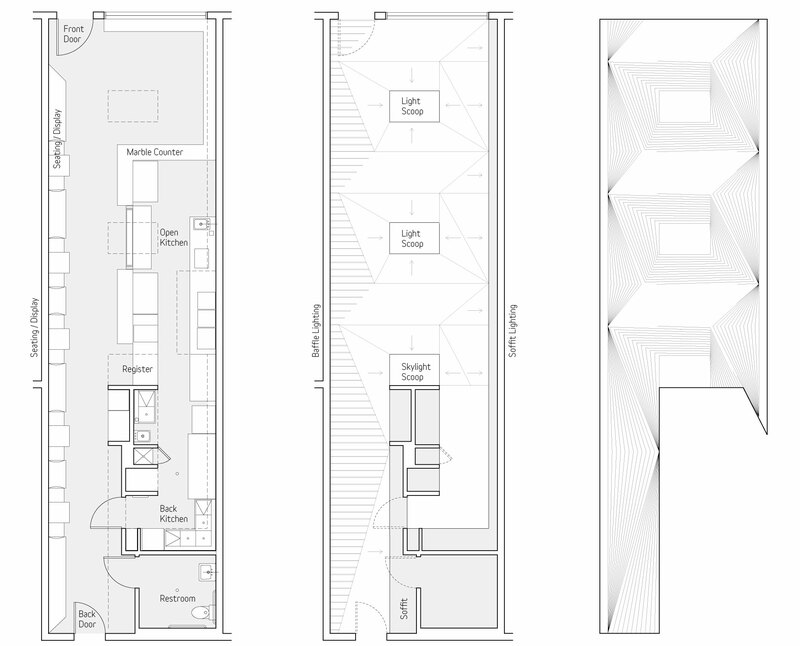 These rhythmic undulations both subdivide the linear space into a series of spatial pockets and produce dynamic spatial continuity from front to back. 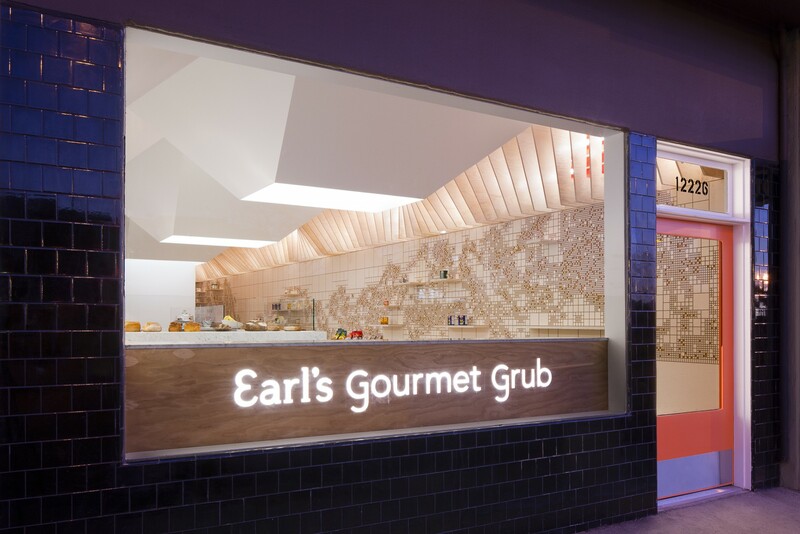 Earl’s was designed to mix genres: torquing ceiling surfaces and inscribed digital patterns are combined with a rich material and color palette to evoke both technological refinement and the more rustic feel of alpine landscapes and Viennese cafes. The clients requested a contemporary architectural identity but one that evoked the rustic or alpine qualities of the fresh ingredients used in the food. 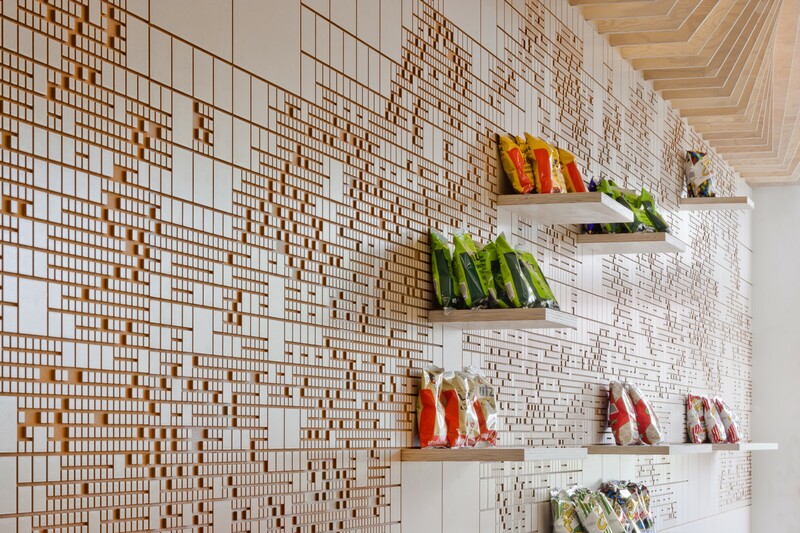 The west wall, which spans the entire depth of the space, is embossed with an image of the Alps abstracted as a series of rectangular computational ‘bits’. 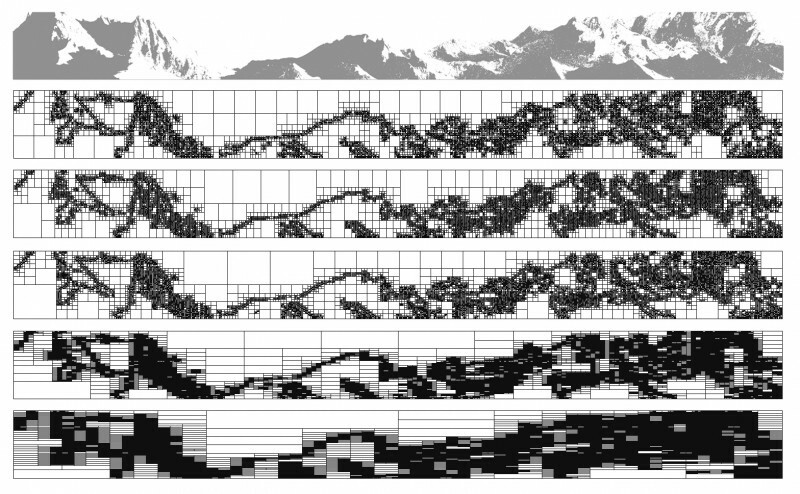 The result – alpine picturesque run through a computational filter – evokes neither pure landscape nor pure technology, opening up a wider range of associations.